UND managed a split on the road and didn't provide the best effort against a decent Omaha squad. They now turn their attention to in-state rival NDSU, who they hope to avenge a 67-65 defeat down in Fargo a few weeks ago. NDSU is in a interesting spot in the Summit Standings. They currently sit in the 4th spot and while a good finish could net them a top 3 finish depending on how the rest of the teams shake out, a losing streak at the wrong time could have the battling with the teams avoiding missing Sioux Falls. UND is going to have to figure out how to deal with the length of Geu and Ward, especially if Avants cannot go tonight. Shahid is also coming off of two decent performances against ORU and WIU, so he could do enough to prevent UND from putting extra pressure on the bigs. UND needs to do more doubling in the post and be ready to supply help defense when necessary. Bascially, I would dare NDSU to beat UND with outside shooting. 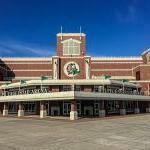 UND cannot afford to waste anymore opportunities at home. They have won 1 time in conference play at home, that cannot continue. They are tied for 7th right now and if they can somehow put together a good finish, they could potentially climb higher... but continues to be in the mire will mean no UND in Sioux Falls. I'd like to see UND come out swinging like they did in Fargo and keep the momentum going, put together a 40 minute game like they did against DU. How bad are the roads up there? Anyone gonna be able to make it to the Betty? Weather will be a factor regarding attendance. Snowing, wind will increase as evening progresses. Nice uniforms compared to the grays they had in Fargo. 9-9, pretty sloppy game. 13 minutes to go in 1st. 30-27 SU @ the half. Big Sky had better teams than this. Only 3 players scored for UND in the 1st half???? Bison call a TO after being trapped.